Dr. Ballou is currently the director of Cantorae St. Augustine, a women’s schola that re-introduced chant and Renaissance polyphony into the Diocese of St. Augustine after a nearly forty-year hiatus. Cantorae has assisted at both Ordinary and Extraordinary Form Masses and has presented Vespers in both Latin and English at the Shrine of La Leche in St. Augustine for over five years. The ensemble has also performed in conjunction with Alondra at historical reenactments and special programs, enabling the sacred music to reach an even wider audience. Another aspect of this work is a weekly classical music radio program that focuses on early music for WFCF Flagler College Radio. In addition to conducting and performing, Dr. Ballou is a regular contributor to Sacred Music journal of the Church Music Association of America (CMAA) on the practical aspects of choir/schola training and management and is a member of the CMAA’s group blog, The Chant Café. Her article, “Setting the Stage: Liturgical Reform in the Mid-20th Century” will be published in the Foundation Theology 2013. As a performing musician, Dr. Ballou presents musical programs that weave the music of Spain, the New World, and the Celts into stories of love, faith, and courage – with a good dose of humor thrown in. 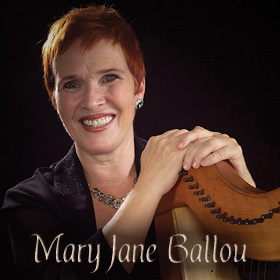 She has produced two CDs of harp music and regularly appears in concert and festival settings in northeast Florida. Recent concerts included “The Colonial Harpist” and “Irish in a Spanish Town,” which reflect the diversity of early Spanish Florida. She studied piano and organ at the San Francisco Conservatory of Music with Marta Bracchi-Le Roux and Joy Crocker and early music with Laurette Goldberg. 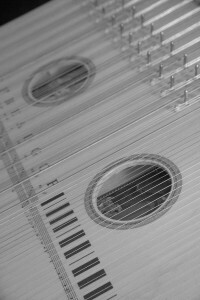 Harp study has been with Megha Morganfield and Victoria Schultz, as well as performance training with Deborah Henson-Conant and Bruce Fertman. Dr. Ballou received her Doctorate in Sacred Music from the Graduate Theological Foundation in 2013, where her focus was the music for Latin Rite funeral rituals before and after the Second Vatican Council. The final performance project included a concert of a cappella music that ranged from chants for the Gregorian Requiem to a 21st century setting of music for the Russian Orthodox funeral liturgy. Dr. Ballou studied Gregorian chant and semiology with Fr. Lawrence Heimann, C.PP.S., St. Joseph College, and Dom Daniel Saulnier, O.S.B. at the Abbey of St. Peter at Solesmes, France. In 2012, she was a participant in the Ninth International Organ and Early Music Festival in Oaxaca, Mexico, allowing her to explore the organs that probably accompanied sacred music in the Spanish borderlands. As the founder of the early music ensemble Alondra in St. Augustine, Florida, Dr. Ballou has researched and presented programs on the sacred and secular musical heritage of the first Spanish settlement in what became the United States of America.